Zero Balancing (ZB) is a hands-on, non-invasive technique of bodywork which balances the human energy field and its anatomical structure. It is gentle to receive but powerful in effect, involving subtle holds, pressure and stretches through the clothes of the recipient. In a ZB session the client remains clothed. It starts with a short interview and then a physical assessment as the client sits on the table. 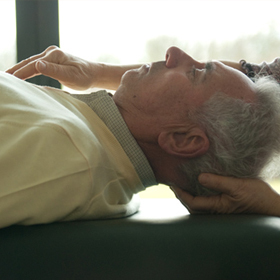 The client then lies face up on the table and the practitioner starts with a gentle curved pull from the client’s feet. At an easy pace the practitioner then evaluates the relationship between energy and structure throughout the body, with particular focus on the joints and skeletal system, and where indicated, releases tensions and tension held patterns. It is a pleasurable experience – everything the Zero Balancer offers the client will either feel good or ‘hurt good’ – the latter often associating with the welcome release of tensions. A session will take between 30-45 minutes and it is usual to feel relaxed and refreshed during and after the session.